For the simulated nuclear detonation, see Minor Scale. In each of these scales, the first, third, and fifth scale degrees form a minor triad (rather than a major triad, as in a major scale). In some contexts, minor scale is used to refer to any heptatonic scale with this property (see Related modes below). Because of this, the key of A minor is called the relative minor of C major. 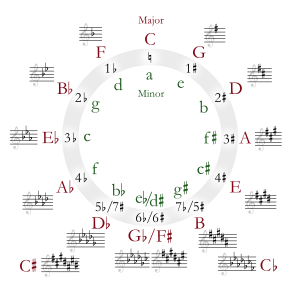 Every major key has a relative minor, which starts on the 6th scale degree or step. For instance, since the 6th degree of F major is D, the relative minor of F major is D minor. Because of this, the key of A minor is called the parallel minor of A major. This pattern of whole and half steps characterizes the natural minor scales. The natural minor scale is maximally even. The harmonic minor scale (or Aeolian ♯7 scale) has the same notes as the natural minor scale except that the 7th degree is raised by one semitone, creating an augmented second between the 6th and 7th degrees. Thus, a harmonic minor scale can be built by lowering the 3rd and 6th degrees of the parallel major scale by one semitone. The scale is called the harmonic minor scale because it is a common foundation for harmonies (chords) in minor keys. For example, in the key of A minor, the dominant (V) chord (the triad built on the 5th scale degree, E) is a minor triad in the natural minor scale. But when the 7th degree is raised from G♮ to G♯, the triad becomes a major triad. Chords on degrees other than V may also include the raised 7th degree, such as the diminished triad on VII itself (viio), which has a dominant function, as well as an augmented triad on III (III+), which is not found in any "natural" harmony (that is, harmony that is derived from harmonizing the seven western modes, which include "major" and "minor"). This augmented fifth chord (♯5 chord) played a part in the development of modern chromaticism. The triads built on each scale degree follow a distinct pattern. The roman numeral analysis is shown below. Because they are generated by just one interval, the inversions of augmented triads and diminished seventh chords introduce no new intervals (allowing for enharmonic equivalents) that are absent from its root position. That is, any inversion of an augmented triad (or diminished seventh chord) is enharmonically equivalent to a new augmented triad (or diminished seventh chord) in root position. For example, the triad E♭–G–B in first inversion is G–B–E♭, which is enharmonically equivalent to the augmented triad G–B–D♯. One chord, with various spellings, may therefore have various harmonic functions in various keys. While it evolved primarily as a basis for chords, the harmonic minor with its augmented second is sometimes used melodically. Instances can be found in Mozart, Beethoven (for example, the finale of his String Quartet No. 14), and Schubert (for example, in the first movement of the Death and the Maiden Quartet). In this role, it is used while descending far more often than while ascending. The harmonic minor is also occasionally referred to as the Mohammedan scale as its upper tetrachord corresponds to the Hijaz jins, commonly found in Middle Eastern music. The harmonic minor scale as a whole is called Nahawand in Arabic nomenclature, as Bûselik Hicaz in Turkish nomenclature, and as an Indian raga, it is called Kirwani. The Hungarian minor scale is similar to the harmonic minor scale but with a raised 4th degree. This scale is sometimes also referred to as "Gypsy Run", or alternatively "Egyptian Minor Scale", as mentioned by Miles Davis who describes it in his autobiography as "something that I'd learned at Juilliard". In popular music, examples of songs in harmonic minor include Katy B's "Easy Please Me", Bobby Brown's "My Prerogative", and Jazmine Sullivan's "Bust Your Windows". The scale also had a notable influence on heavy metal, spawning a sub-genre known as neoclassical metal, with guitarists such as Yngwie Malmsteen, Ritchie Blackmore, and Randy Rhoads employing its use in their music. The distinctive sound of the harmonic minor scale comes from the augmented second between its 6th and 7th scale degrees. While some composers have used this interval to advantage in melodic composition, others felt it to be an awkward leap, particularly in vocal music, and preferred a whole step between these scale degrees for smooth melody writing. To eliminate the augmented second, these composers either raised the sixth degree by a semitone or lowered the seventh by a semitone. Theme in G melodic minor from the opening of the second concerto in Vivaldi's L'estro armonico (1711) Although the piece is in G minor, the key signature is for G Dorian (one flat). By convention, in modern notation (and for tonal music written since the common-practice period), key signatures are typically only based on a major (Ionian mode) or minor (natural minor or Aeolian mode) key, not on modes like the Dorian mode. Composers have not been consistent in using the two forms of the melodic minor scale. Just as often, composers choose one form or the other based on whether one of the two notes is part of the most recent chord (the prevailing harmony). Composers frequently require the lowered 7th degree found in the natural minor in order to avoid the augmented triad (III+) that arises in the ascending form of the scale. In jazz, only the ascending form of the scale is usually used. Examples of the use of melodic minor in rock and popular music include Elton John's "Sorry Seems To Be The Hardest Word", which makes, "a nod to the common practice... by the use of F♯ [the leading tone in G minor] as the penultimate note of the final cadence." In modern notation, the key signature for music in a minor key is typically based on the accidentals of the natural minor scale, not on those of the harmonic or melodic minor scales. For example, a piece in E minor will have one sharp in its key signature because the E natural minor scale has one sharp (F♯). Major and minor keys that share the same key signature are relative to each other. For instance, F major is the relative major of D minor since both have key signatures with one flat. Since the natural minor scale is built on the 6th degree of the major scale, the tonic of the relative minor is a major sixth above the tonic of the major scale. For instance, B minor is the relative minor of D major because the note B is a major sixth above D. As a result, the key signatures of B minor and D major both have two sharps (F♯ and C♯). Sometimes scales whose root, third, and fifth degrees form a minor triad are considered "minor scales". In the Western system, derived from the Greek modes, the principal scale that includes the minor third is the Aeolian mode (the natural minor scale), with the minor third also occurring in the Dorian mode and the Phrygian mode. The Dorian mode is a minor mode with a major sixth, while the Phrygian mode is a minor mode with a minor second. The Locrian mode (which is very rarely used) has a minor third but not the perfect fifth, so its root chord is a diminished triad. ^ Kostka, Stefan; Payne, Dorothy (2004). Tonal Harmony (5th ed.). New York: McGraw-Hill. p. 12. ISBN 0-07-285260-7. ^ Prout, Ebenezer (1889). Harmony: Its Theory and Practice, pg. 15, 74, London, Augener. ^ Forte, Allen (1979). Tonal Harmony, p.13. Third edition. Holt, Rinhart, and Winston. ISBN 0-03-020756-8. ^ Davis, Miles; Troupe, Quincy (1990). Miles, the Autobiography. Simon & Schuster. p. 64. ISBN 0-671-72582-3. ^ "Neo-Classical Metal Music Genre Overview | AllMusic". AllMusic. Retrieved 2018-11-26. ^ Forte, Allen (1979). Tonal Harmony, p. 13. Third edition. Holt, Rinhart, and Winston. ISBN 0-03-020756-8. Hewitt, Michael. 2013. Musical Scales of the World. The Note Tree. ISBN 978-0-9575470-0-1.